…originally published Sunday, April 20, 2014. This trial post for a series that never materialized has been among the blog's most popular posts, 2,300 visits and climbing. The post was so labor intensive and time consuming to edit that I never got around to another. Shorter posts would have been a better choice too. Rather than the promised shorter posts, I have not been posting at all. How much shorter can a post get? Although not always clearly indicated, commentary accompanying links is, unless otherwise noted, either Keith's commentary originally posted to the adj-l list and republished here with Keith's permission or quoting him directly from the original article. Should the series resume, I'll make that clearer when I revise the format. …Issue #1 blogging materials and words from and on behalf of legendary (but social media averse) adjunct activist, Keith Hoeller. This project is still in Beta, so expect changes. 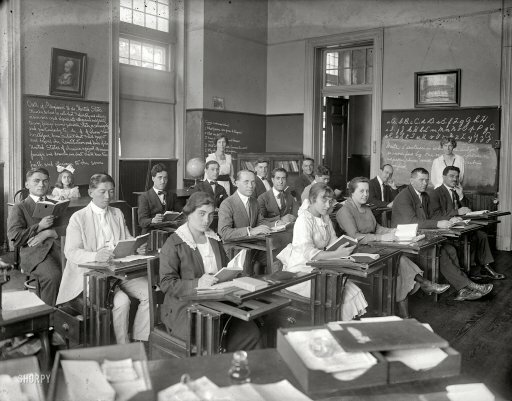 I edited the auto-blogged Diigo bookmarks to tidy up format, added the vintage image of a 1907 classroom, and rearranged the order to lead with the NY Times OpEd, related links and commentary, including a copy of Keith's unpublished letter to the editor, plus a link to the published response letters.